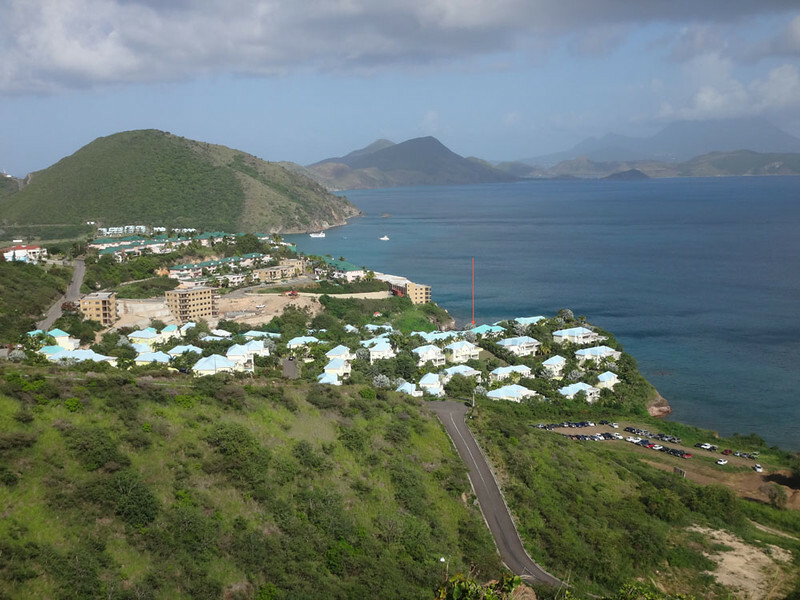 In March I arrived on the Caribbean island of St Kitts to take up my faculty post at Ross University School of Veterinary Medicine, where I'm an Associate Professor of Welfare and Ethics, and Director of the Clinical Skills Laboratory. In addition to these photos, I've had a number of amazing adventures up our volcano and elsewhere, and will add more photos later when time permits. 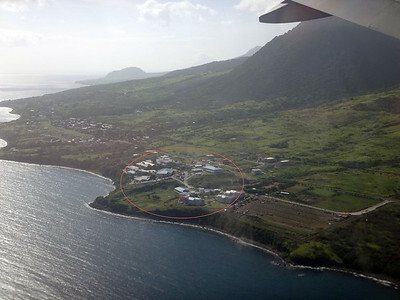 Circled in red is the university. A steep trail leads down to the (rocky) beach. 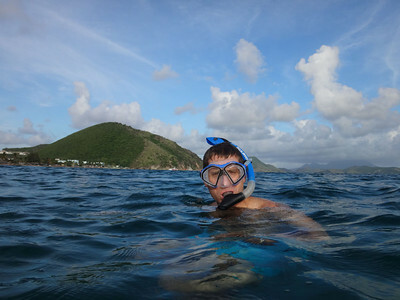 Apparently the snorkelling is not bad! (Not that I've ever had time to find out). My office is in the biggest building up on the (small) hill. 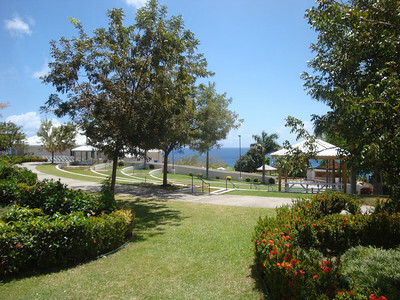 The lawns in front of the Student Union - one of the most beautiful campus views. 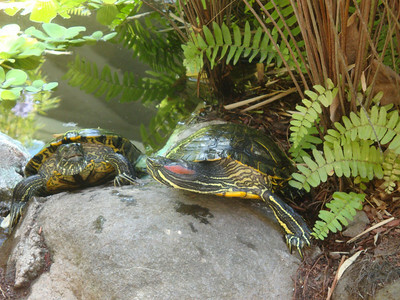 These wise red slider turtles inhabit a pond in the heart of campus. They've been there longer than most of us, and are good to talk to. When I first arrived I was given temporary accommodation here in Horizons. 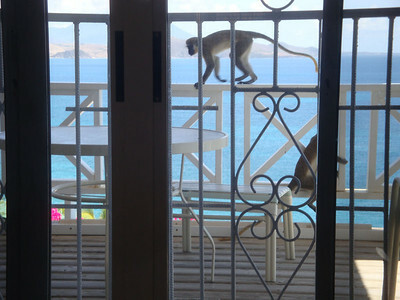 This was my balcony view. 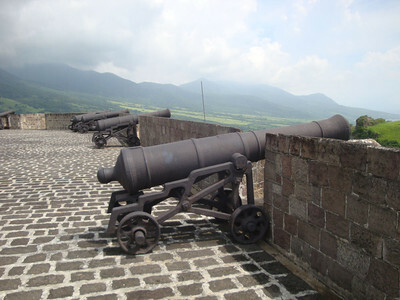 The low peaks are the southern peninsula, and the big peak is a volcano on the next island of Nevis. 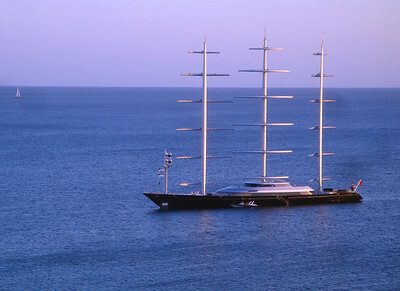 The mega-yachts of the very wealthy regularly moored in front of my balcony. 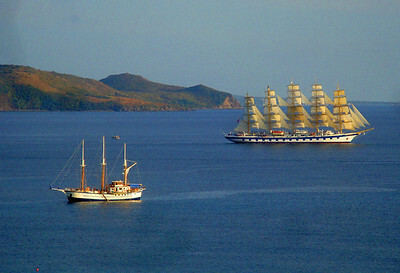 And cruise ships dock daily in town during the dry season, and every few days the rest of the year. 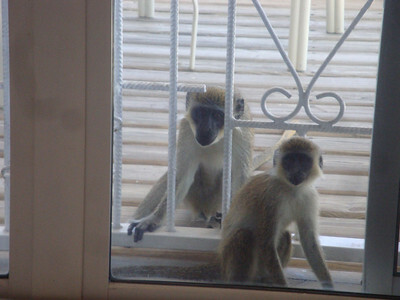 Monkeys are ubiquitous and also enjoyed my balcony. 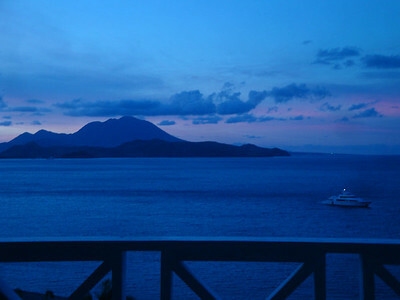 I would spend ages just admiring the views at dusk and after. 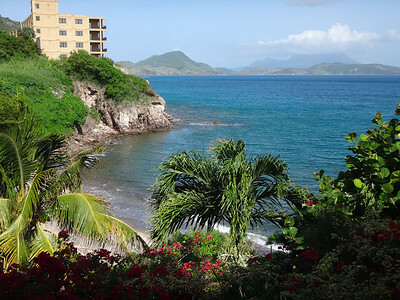 Then I moved to the Calypso Bay Resort. I rent a little bungalow just below the red arrow. 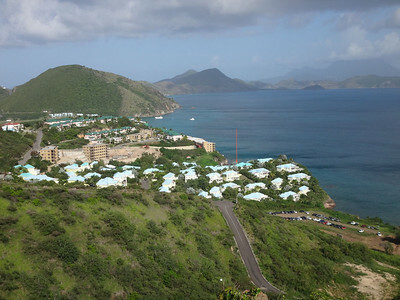 The Horizons bungalows where I stayed before are up on the hill with the green roofs. 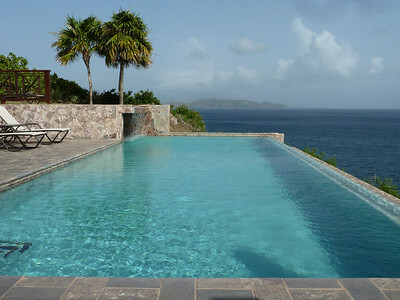 My bungalow is the closest to the water. 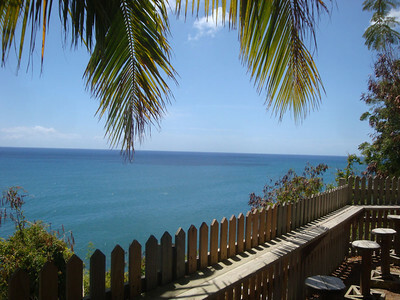 This is the view from my balcony to my almost private beach and beyond. 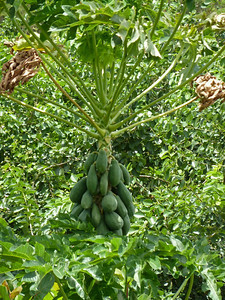 Also visible from my balcony are papayas too high for me to reach. Mangos are everywhere, and fortunately I can reach those. 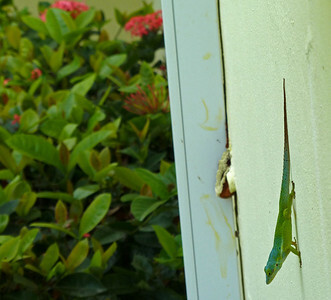 I get numerous visitors including monkeys, hermit crabs, non-hermit crabs, bats, mongoose, and these amazing green lizards. 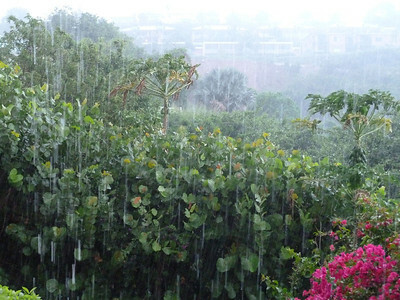 During the wet season (May - Nov) it rains almost daily. It ca be heavy but is usually short. Half an hour later the sun can be blazing and it's hot again. It can make it uncomfortably humid, though. 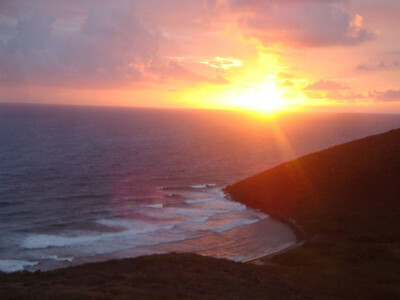 It's wonderful any time of day, but especially at sunset. The vegan options are limited compared to my pampered life in the UK. 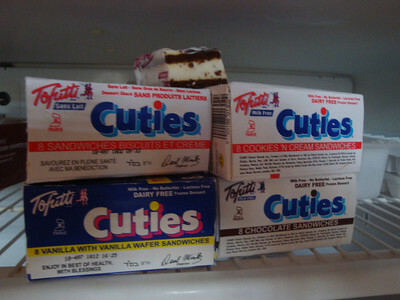 They do have tofutti cuties for desert, however - and little else! Thankfully there are plenty of places to escape my own cooking. This restaurant is built over the water. 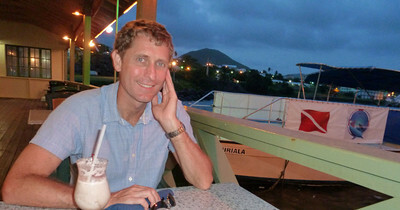 Note the dive boat in the background - diving is a great recreational activity here. A couple of times/week I get time to explore in front of my bungalow. 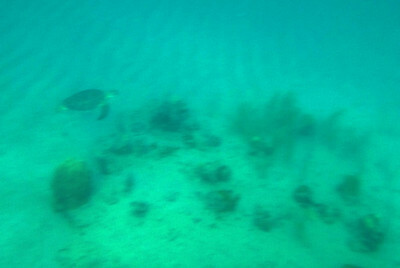 I've found 2 small wrecks, 1/2 a dozen sea caves in the cliffs, and a bunch of amazing marine animals. And a little bit of coral. I'm not the most elegant swimmer. 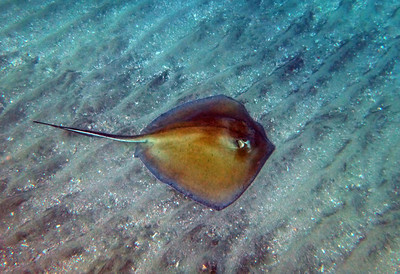 I see rays on every serious snorkel. And sea turtles about every second time, if I go far enough. 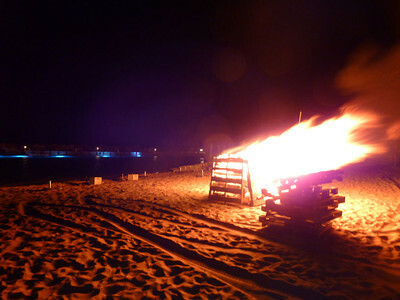 Unusually, this one was in front of my bungalow. 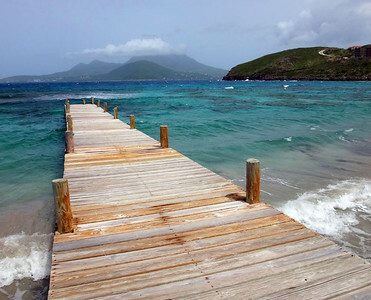 My favourite place on St Kitts is the awesome southern peninsula. 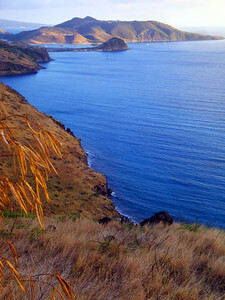 The Caribbean islands are volcanic, and here you can see the flooded crater of one of the old volcanos. 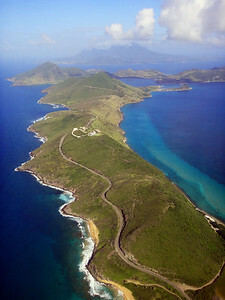 Here it is again, looking south, with the island of Nevis in the distance. 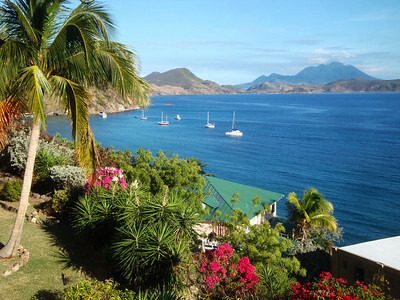 11 km of steep, winding terrain, between the Atlantic ocean (L) and Caribbean Sea (R). With a swim at the end, this has to be one of the world's best running routes. I do it most weeks around dawn. Partway along the peninsula is my favourite lookout point. 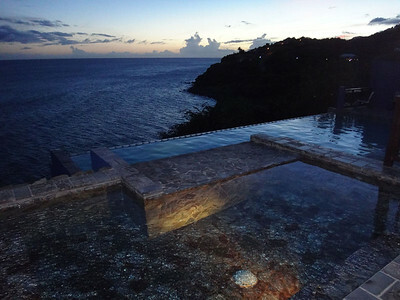 The views over the Caribbean Sea at sunset are incredible. From about 200 m high the water looks a bit like beaten metal, ever-changing with the wind. It's incredibly beautiful. 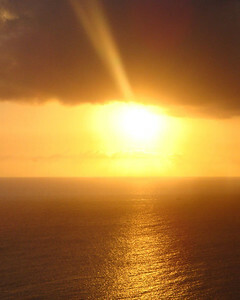 This is a view over the Atlantic, at dawn. 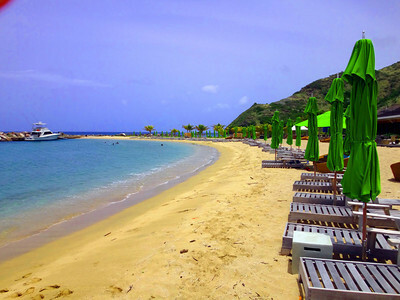 This is the Carambola Club - one of several cafes along the peninsula. Most offer deckchairs. That attract an amazing variety of fish, which are great fun to watch. Ever since the colonial navies waged major sea battles in medieval times, there have been wrecks littering the seabed and coast. 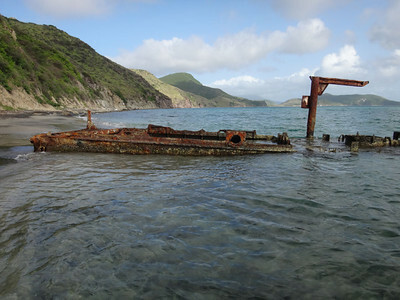 Several modern wrecks are accessible from the beaches. 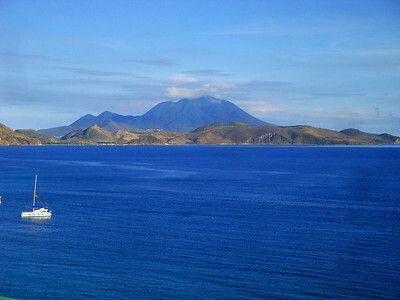 Turtle Beach, with Nevis in the background. 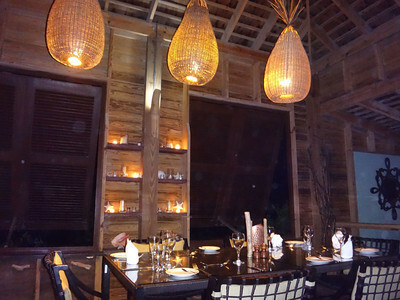 and it has a great view of Nevis which is especially pretty after dark when their lights come on. 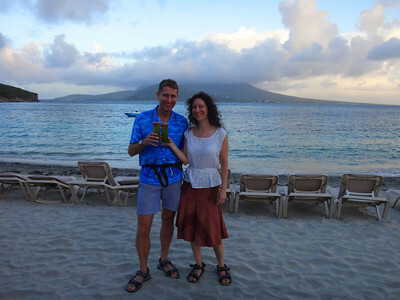 Each year there is a swimming race from Nevis to St Kitts - 2.5 miles across the open sea, shepherded by sea kayaks. My new colleagues were competing shortly after I arrived, and I felt peer-pressured to join. After all, they were women, and being a bloke I couldn't chicken out... it was brilliant and amazing. There were points from which I couldn't see land (due to the swell). 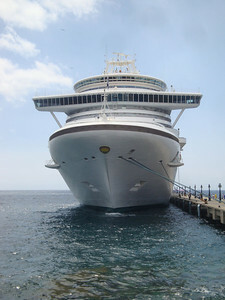 We drifted in all directions but eventually made it across. 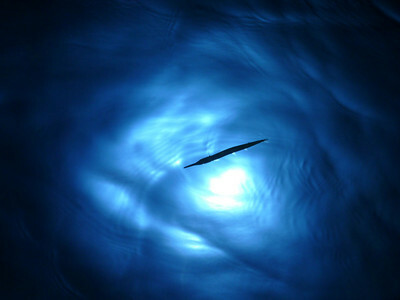 There were big rays and other interesting wildlife, but the hammerhead shark seen 2 years ago (and always in the back of my mind) never appeared. 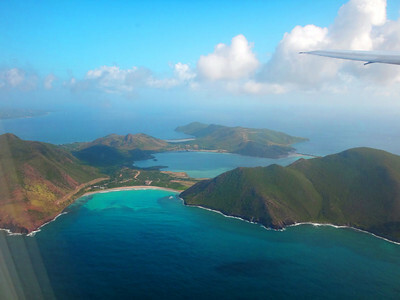 Here I've just arrived on St Kitts. 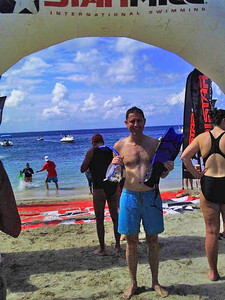 The next competitor is emerging from the water behind me. 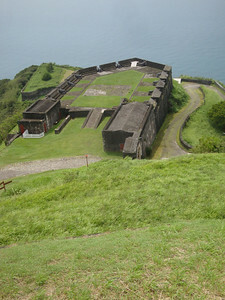 In medieval times, the Caribbean islands were hotly fought over by the French and British, among others. 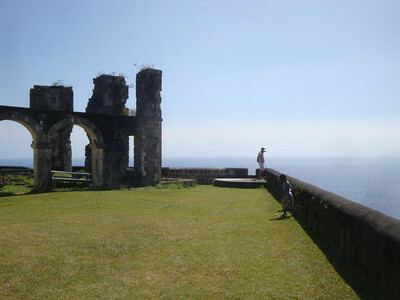 A series of ruined stone forts dots the coast, and the waters are filled with wrecks. 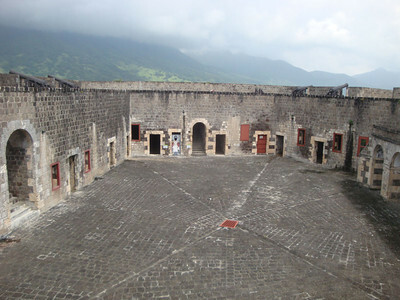 This is the biggest fort on St Kitts, Brimstone Hill. 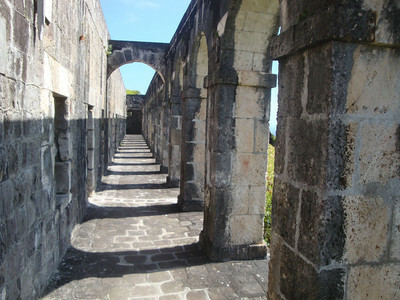 The arches to the right are the officers quarters - they had amazing sea views. 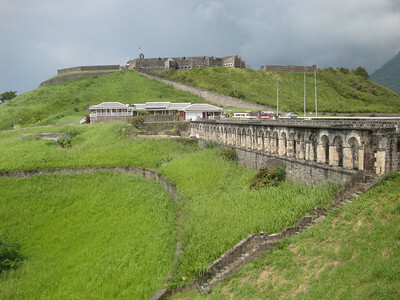 This fort was actually besieged and eventually fell to the French after an epic protracted struggle.